“This is the Scroll of Thoth. Herein are set down the magic words by which Isis raised Osiris from the dead. 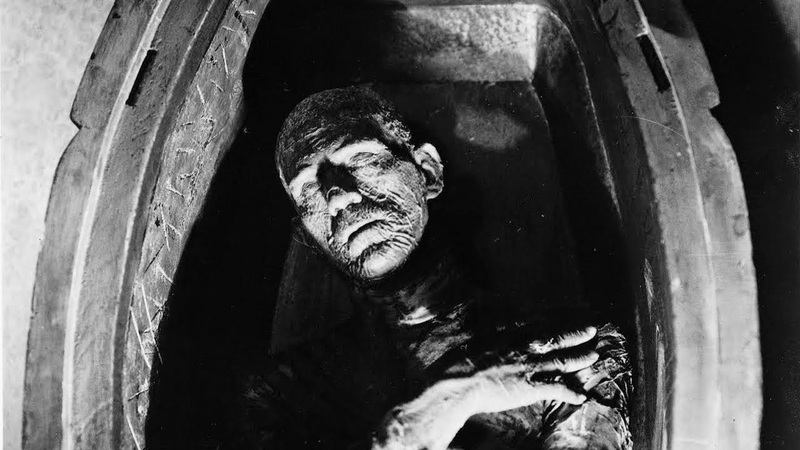 Up until now, horror films tended to be either adaptations of books, folklore or both, but The Mummy was something new. For all it’s ancient curses and historical Egypt shenanigans, the main inspiration here was bang up to date, at least for 1932. Coming only ten years after opening of Tutenkhamun’s tomb, the general public were fascinated by the whole concept, making it ripe to be turned into a hit horror film. Okay, it’s storyline probably owed a fair bit to Dracula, but for the most part, The Mummy’s cloth-wrapped feet were treading new ground. 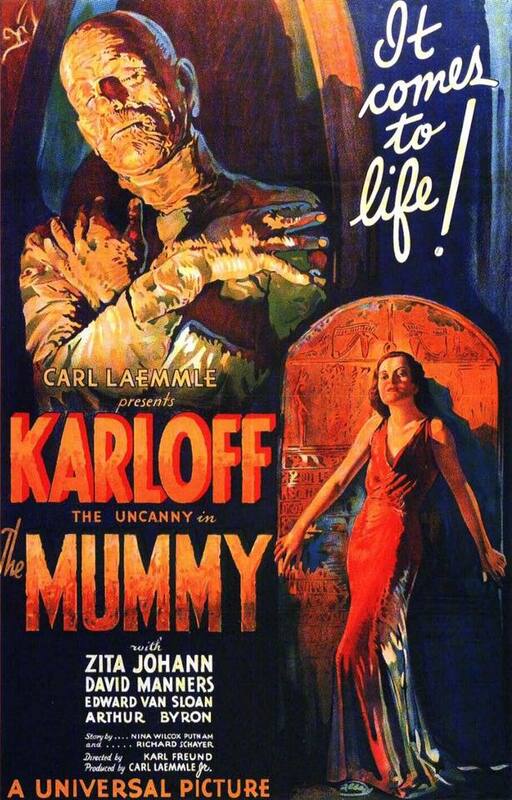 A team of British archaeologists led by Sir Joseph Whemple (Arthur Byron) uncover the mummified remains of the ancient Egyptian prince Imhotep (Boris Karloff), along with the previously unseen scroll of Thoth, noting that this particular Mummy appears to not have been eviscerated in the usual style, he has been buried alive. 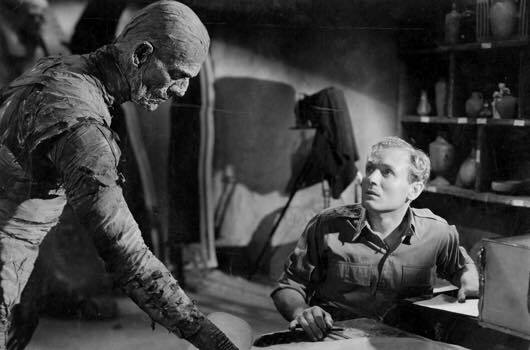 Imhotep is revived when, against the warnings of Whemple’s senior colleague Dr. Muller (Edward Van Sloan), Sir Joseph’s assistant Ralph Norton (Bramwell Fletcher) reads aloud the scroll, giving life to the mummy and being driven terminally insane himself in the process. A decade later, Imhotep is living in modern-day Egypt under the guise of local Cairo resident Ardath Bey, guiding Sir Joseph’s son Frank (David Manners) and Professor Pearson (Leonard Mudie) to the tomb of the Princess Ankh-es-en-amon, his lost love from nearly 4000 years before. While undoubtedly being a horror classic, there’s not a massive amount of horror in The Mummy. Very much taking it’s cues from 1931’s Dracula (which was based on scriptwriter John L. Balderston’s stage adaptation and shot by director Karl Freund), it’s a adds a dose of gothic romance to the Stoker story, making it a tale of love across millennia, where the main driving force behind it is the love one man has for one woman, even after 3700 years. Boris Karloff is simply magnificent here. He always is, let’s be honest, but there’s something wonderfully ancient about his performance here that really convinces you that he’s as old as he’s meant to be. First off, he gets a gloriously portentous world-building intro, with the archaeologists setting up his whole story as they read hieroglyphics around his casket and assess his muscle shape, establishing that he was buried alive and sentenced to death not only on this world but the next one. Instantly, you feel for this character and want to know what he could possibly have done to deserve such a punishment, but it’s all down to Karloff to make sure it pays off and he does it in spades. When he first awakens under Jack Pierce’s beautiful bandaged mummy make-up, he plays it so low key. There’s no dramatic eruption, just the barest of eyes flickering open, as if even the dim light from the nearby lantern hurts after so many thousands of years of darkness. Similarly, his hands move so awkwardly, you can almost hear the atrophied muscles crack as they are used for the first time in a near-eternity. In a way, it’s a shame we don’t see any more of the bandaged version, but it adds even more weight to the classic scene where he goes “for a little walk”, driving poor Norton irredeemably insane in the process. 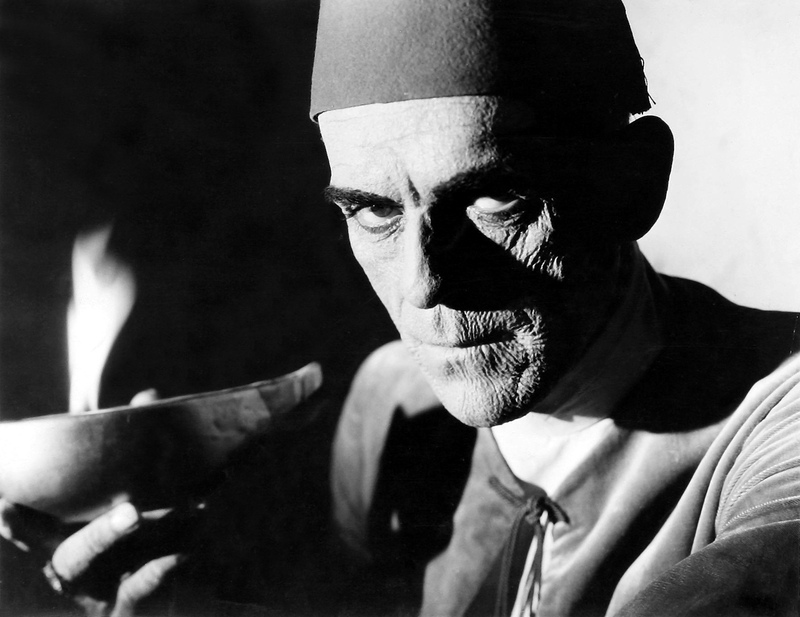 As Ardath Bey, Karloff is just incredible and comes over every bit as ancient as his bandaged self. Physically, he looks like he’s made of papyrus, like his dried flesh might blow away in a strong gust of wind, while that low, sonorous voice hints at his age, just like the way he moves so slowly too; it all points to someone who should have been dead and buried a long time ago. Dracula can move in high society and not give himself away immediately, Bey is just…wrong and Boris Karloff simply nails it. The flashback scene that tells us just how Imhotep ended up with such a fate is fascinating, if a tad overlong (and was edited down apparently), with the decision to shoot like a silent adding to its archaic atmosphere. Thankfully Zita Johann more than holds her own against such a heavyweight performance in the double role of Helen Grosvenor / Princess Ankh-es-en-Amon. Playful and charming, she’s no damsel in distress, even when the jig is up and Imhotep is giving her the hard sell over her past life and potential endless future with her undead ex-lover. Karl Freund directs the whole thing with a deft touch, driving the drama along without losing any of the white moments, while allowing for big dramatic beats like the even by then trademark close ups on his face, eyes and mouth. There’s not a huge amount of action or indeed, overt horror, but Freund and his leading man keep you gripped almost until the final scene. It’s there that The Mummy finally drops the ball with a literal Deus Ex Machina, with a statue of the goddess Isis raising her hand to destroy the scroll that has prolonged Inhotep’s life, leading to a too-quick and poorly realised fade effect as time catches up with him. It’s a weak ending to a film that deserved much more, but up until then, The Mummy is gripping stuff. From here on in, each sequel and remake up until Blood From The Mummy’s Tomb would focus on the mute bandaged avenger aspect of The Mummy, but in focusing on the character under the cloth, Karloff set a bar that few would come close to ever touching. Perfect? Not quite. A masterpiece? Most definitely.